Palisade hop pellets. 5.5-9.5% AA. Fruity aroma with earthy undertones. Grassy and piney with hints of apricot. 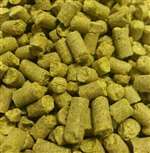 Used as a dual-purpose hop for all English style beers. Use Willamette or Goldings for possible substitutions.